Household chores have never been comfortable but have been made easier with the advent of technology. Dishwashers have replaced washing dishes manually; vacuums are a standard way to get the house clean and washing and drying clothes have been made easy, thanks to many high-tech washers and dryers available in the market. A washer and dryer is something every household needs irrespective of how large or small it is. While a lot of people think that they need to spend at least USD 1000 to get a washer and dryer set, there are a lot of washers and dryers in the market that you can get under USD 750 quickly and that too made by a giant manufacturer like Whirlpool. Here are our reviews of two of the efficient and cheap washers and dryers that are made by Whirlpool. The Kenmore 2620232K washer is priced less than USD 300 and is a top loading washing machine. You can be assured of a decent cleaning performance as Whirlpool makes this Kenmore model for the brand. You can even find this washer dryer on sale at a much cheaper rate than its original upfront cost of USD 299. This Kenmore washer has a wash drum with a 3.5 cubic feet capacity which may be smaller than many top rated washing machines but can take a decent amount of load. The model has a sensor that senses the load to fill the appropriate amount of water to ensure responsible use of water. The washer also has a deep fill option for washing clothes that may need more water than the rest. The Kenmore 60222 dryer uses electricity to run and matches with the Kenmore 2629233K washer. The model’s motion sensor ensures speedier drying of clothes and helps save time and energy. This sensor may be lacking in most of the other cheap washers and dryers which sometimes leads to over-dried and damaged clothes. Overdrying can cost you money in terms of the power being used. There is a gas run model of the make available too, but that is priced at a higher value than the electric one. This electric model is priced at USD 299. If this still falls out of your budget, you can explore the option of a used washer dryer on sale for low prices. Just like Kenmore, Amana washers and dryers are made by Whirlpool Corp as well. When it comes to cheap washers and dryers, Amana NTW4516FW gets the spotlight with an excellent cleaning performance. The model looks similar in style and functions with the Kenmore models since the maker of both these brands is the same. The model is priced at USD 299 at Home Depot and Best Buy which is among the lowest as compared to other places where it is priced higher. The dryers, just like the washers have all the functions like the above mentioned Kenmore dryer but has more drawbacks. This one too is one of the cheap washers and dryers that easily cost under USD 750. One of the main disadvantages is the missing buzzer that the Kenmore model has. Amana dryers and washers are available at a number of stores. The model is priced same as the Amana NTW4516FW mentioned above, and matches in design and style too to be placed as a set. 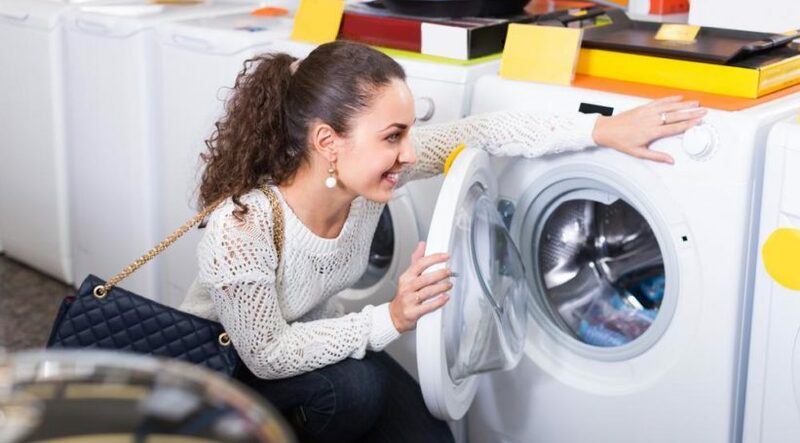 If you decide to buy one of the cheap washers and dryers, make sure you find out all that you need about the make and model to understand its compatibility with your needs.